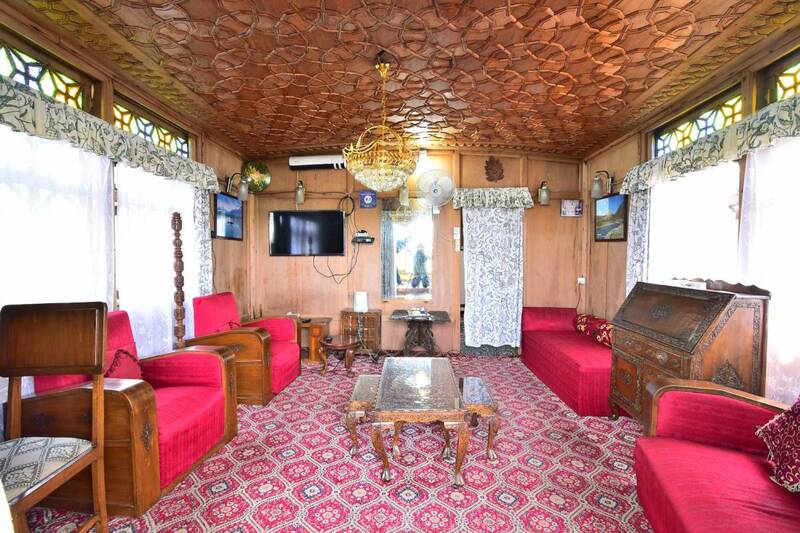 Houseboat Zaindari Palace Group Of Houseboats are run in economy and luxury grades, comparatively all suitable rates. Each houseboat is having the capacity of two to five bedrooms, adjoining bathrooms, a drawing room, a pantry, the upper deck, with a separate kitchen boat, partly occupied by the staff . 'Living on water is traditional in Kashmir and without having that opportunity, at least once, the visit (to Kashmir) remains incomplete, for missing the fascinating charms, offered nowhere in the world. In the peaceful aquatic surroundings, detached from the usual frenzy of city life, the sight revels at glowing reflections of the horizon, intercepted by the shimmering moonshine over the surface of water, facing a fragrant breeze; while as the mind remains bewitched by a tiny amusing kingfisher in brilliant plumage, restlessly darting and diving deep for its next victim. At leisurely hours cruising by a Gandola type Shikara fetch a delightful scene of floating gardens dotted by smiling lotus and bloom . If there is any place on earth that can be crowned as the Empress of natural beauty that would undoubtedly be Kashmir. Rightly called as the Heaven on Earth this small valley along the Himalayan range is testimony to how gorgeous and giving nature can be. Of the numerous enthralling attractions of Kashmir Valley is the breathtakingly beautiful Dal Lake. Covering an area of 26 square km, 8 km in length and 4 kms wide, it is the second largest lake of Jammu and Kashmir and an important tourist attraction. Surrounded by pleasing vegetation made up of gardens and orchards and wrapped up with fresh cool breeze, this lake is best explored and enjoyed in a houseboat. Houseboats in Dal Lake is an integral part of its existence and offers a memorable stay and experience that lasts a lifetime. 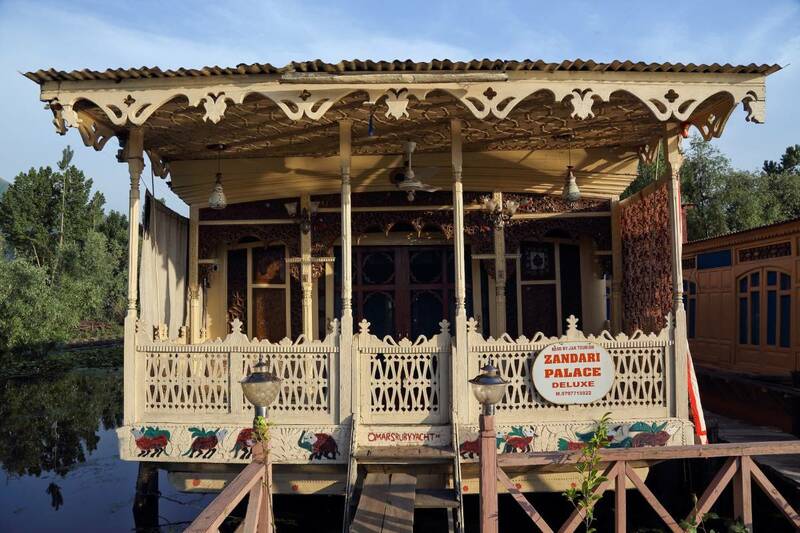 Houseboat Zaindari Palace Group Of Houseboats are run in economy and luxury grades, comparatively all suitable rates. 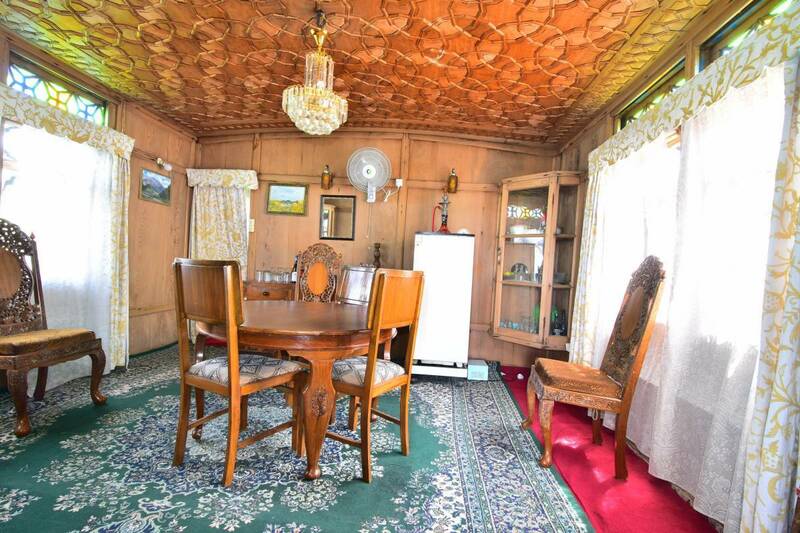 Each houseboat is having the capacity of two to five bedrooms, adjoining bathrooms, a drawing room, a pantry, the upper deck, with a separate kitchen boat, partly occupied by the staff . Surrounded by pleasing vegetation made up of gardens and orchards and wrapped up with fresh cool breeze, this lake is best explored and enjoyed in a houseboat. Houseboats in Dal Lake is an integral part of its existence and offers a memorable stay and experience that lasts a lifetime. Sonmarg Moutain 98 Km Away From Srinagar . Pahalgam100 Km Away From Srinagar . We Arange Moutain Trekking Under Expert Guides. Cab Rental Available 24 Hours. SXR Railway Cabs Are Available 24 Hours. Nearest airport: 22 Km SXR Srinagar Airport.